Leo, who was born on 11/17/2002 and became a beloved family member of ours on 3/19/2003. We thank Toscha and the Midwest BREW team for bringing him into our lives. He grew into a 70lb beagle/fox hound mix and could run like a greyhound. Although Leo passed away 12/27/16, we have so many fond memories and adventures of Leo over the almost 14 years he lived with us. I recall each Christmas, he always sniff around the presents (like all beagles do) and ultimately found the candy. Speaking of food, a couple of times, we left the roast beef platter a little close to the dining room table's edge. Sure enough, when we looked to clear the dishes, we noticed the roast gone and Leo sitting in the corner of the room licking his chops. Did I mention he ate well? There were times he was actually playing with us. Leo would grab a sock run to a spot and tease us into trying to grab it. Just when we thought we had it, he dashed away. The game would continue until he decided he was bored. Leo made us laugh, but more importantly, he gave us all unconditional love. 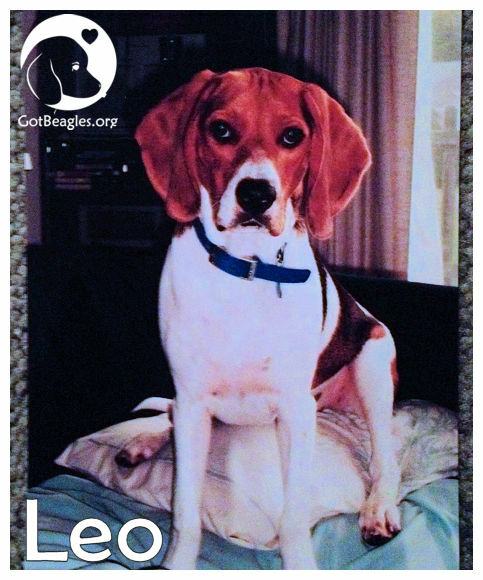 Personally, no matter what mood I was in, Leo would lick my face, lie next to me or give me a bid "arooo" beagle call. He loved his human mommy and many times they would take a nap on the couch together, especially when our kids were in school. As soon as he heard the bus stop in front of our house, he jumped off the couch and gave them a "Welcome-home!-How-do-you-do?" bark to the kids as they came into the house. Leo was also a great protector to my family. He monitored the yard and barked at strangers or other dogs as they walked by. When a stranger came into the house, Leo was there barking, but also on the lookout for that person’s actions. In fact, he would not leave the room until we gave the OK sign. He certainly would sound the alarm when hearing unusual sounds close to the house as well. It is not easy losing a loved one such as Leo. We loved him as much as a family member. We are still grieving; but we know he is in a good place and we will see him again someday. His memory will always be with us.